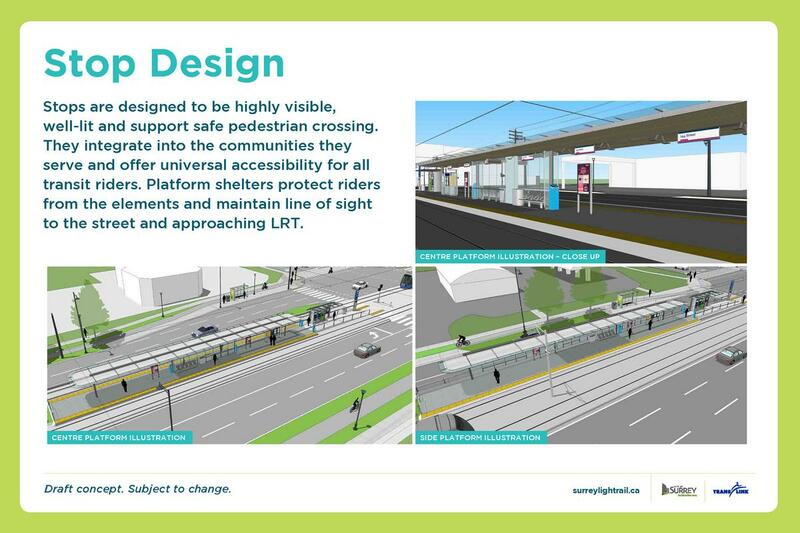 The City of Surrey began a series of 3 open houses on Thursday for Phase 1 of the upcoming Surrey LRT project. This latest public engagement is the 3rd round of open houses on Phase 1 the project, providing refined plans based on public input from previous consultations. Presented at the open house were preliminary station designs, road designs, information on construction planning, environmental and socio-economic study results, and more. A full set of the Open House Boards can be found here. Overall, stations are designed to be highly visible, well-lit, and well integrated into the community – accessible by well-marked pedestrian crossings providing universal accessibility for all riders. Lengthy platform shelters protect riders from weather, and include space for ATM’s, information boards, seating, and more – while maintaining a clear line of sight to the street and approaching trains. 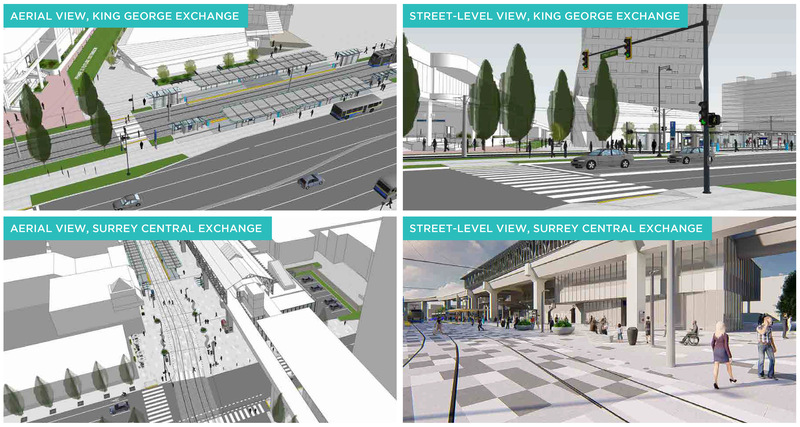 Stations will in most cases be located in the centre median of the street, with the exception of King George, Surrey Central and Newton Town Centre – where they will be plaza oriented, or off to the side. Public art will also be integrated into stations along the route. LRT will run on its own dedicated track for the entirety of the line, with the exception of City Parkway where it will be integrated into a pedestrian plaza. Placement of the LRT track will vary – typically located in the centre median for most of the route, but off to the side in some sections. 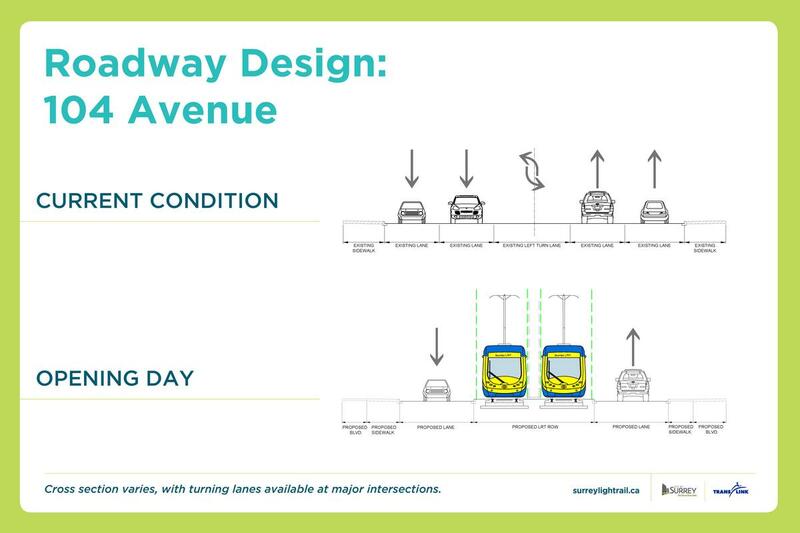 Roadway design for 104 Avenue will consist of LRT in the centre median, and 1 traffic lane in each direction, widening to include an additional turning lane at major intersections. 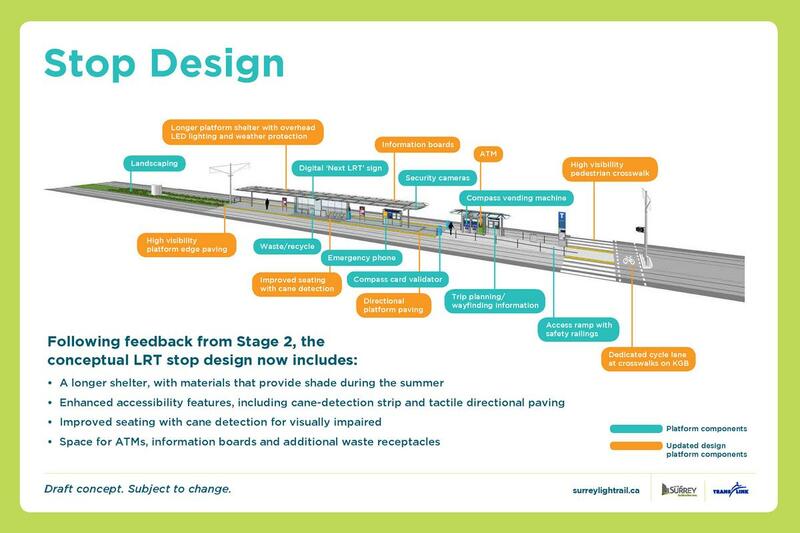 The 104 Avenue design will also provide upgraded and enhanced sidewalks, pedestrian crossings, and connections to stations. Currently 104 Avenue functions as a non-pedestrian friendly, busy arterial for cars. A re-purposed 104 Avenue with LRT will transform the street into a calmed, pedestrianized and transit-oriented corridor, supported by multi-family housing and streetfront shops along the route. The newly widened 100 Avenue and existing 108th Avenue corridors will become the new car-prioritized east-west routes between City Centre and Guildford while 104 Avenue will be the pedestrian/transit prioritized corridor. 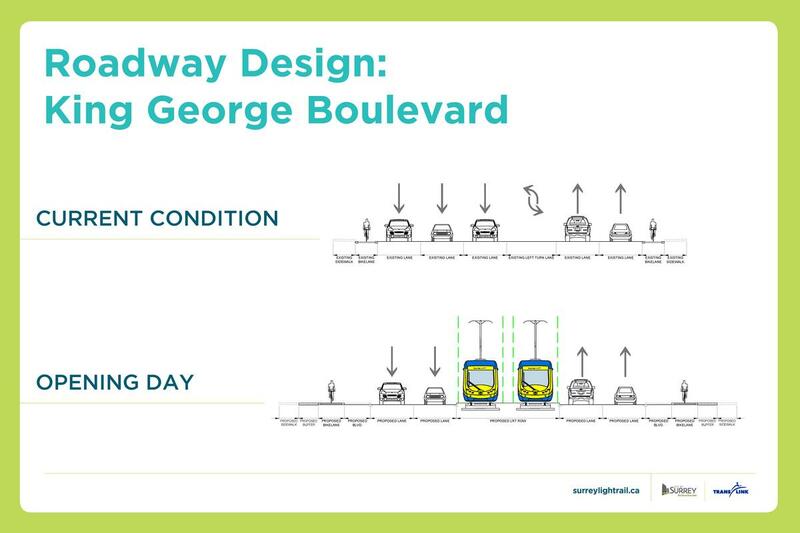 Roadway design for King George Blvd will retain 2 traffic lanes in each direction while allowing for LRT in the median for the majority of the route. Sections of King George in City Centre will see LRT routed off to one side. New separated bike lanes, enhanced sidewalks, and pedestrian crossings will also be a key component of the re-designed King George. Taking inspiration from leading cities around the world, Surrey Central and King George Stations in City Centre are designed to be integrated into new pedestrianized public plazas. These plazas will help to create vibrant transfer points between LRT and SkyTrain’s expo line, similar to plaza’s found throughout Europe with multi-modal rail connections running through them. More doors for boarding, significantly reducing stop times at stations, and travel times overall. Nearly twice as frequent peak service as the existing 96 B-Line peak bus service. A smoother, more comfortable ride than B-Line bus, with less stop and go. 96 B-Line subject to traffic congestion – travel times between Guildford and Newton up to 50 mins during peak hours. One of the key benefits of LRT is its integration with the community and streetscape compared to SkyTrain. While SkyTrain serves well as a long distance commuter rail service, LRT is better suited to more localized routes in the region – similar to other cities where there are various tiers of rail transit making up the regional transit network. Not every line in a city needs to be the same type of rail transit – LRT, Subway, and Commuter Rail are often combined to compliment each other and serve different needs. The introduction of LRT to Metro Vancouver represents a maturing of our rail transit network into a multi-modal system, and it is very likely we will see LRT implemented elsewhere in the region following Surrey. In Surrey, the 104 Avenue and King George Highway corridors that make up the ‘L’ line are much better suited to urban-style LRT than SkyTrain. Not only is this route more localized than regionally serving, but SkyTrain just doesn’t make sense from a cost perspective, and the impacts that such guideways would have on the streetscapes. 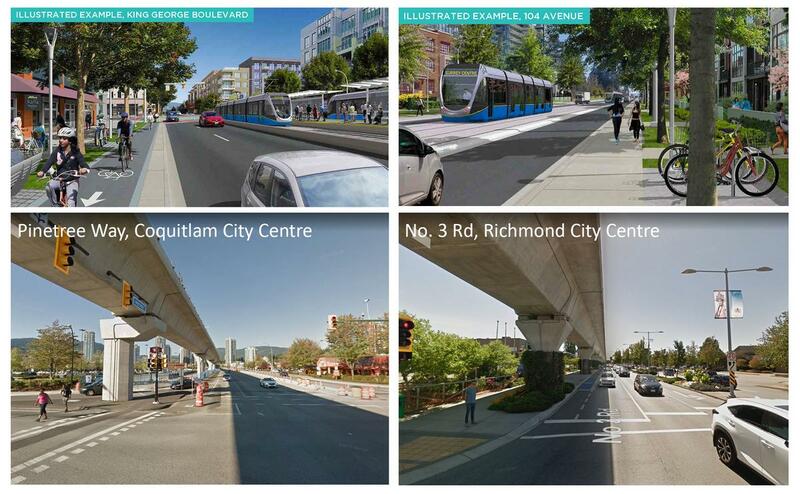 Looking at a comparison between SkyTrain guideways in Richmond City Centre and Coquitlam City Centre, it is clear to see how much better LRT integrates with the streetscape and community it passes through, rather than bisecting it with an obtrusive, shadowing, and noisy concrete structure. 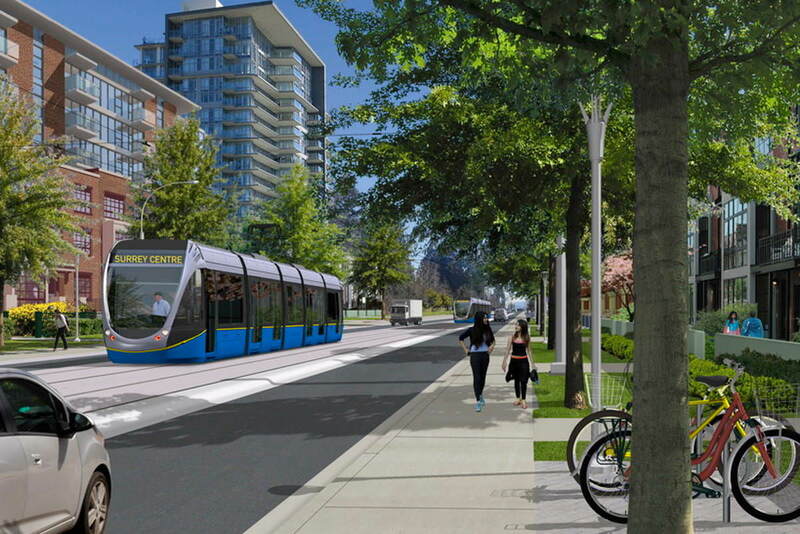 LRT can transform a streetscape into an inviting, pedestrian friendly, vibrant urban environment – whereas SkyTrain does the opposite. 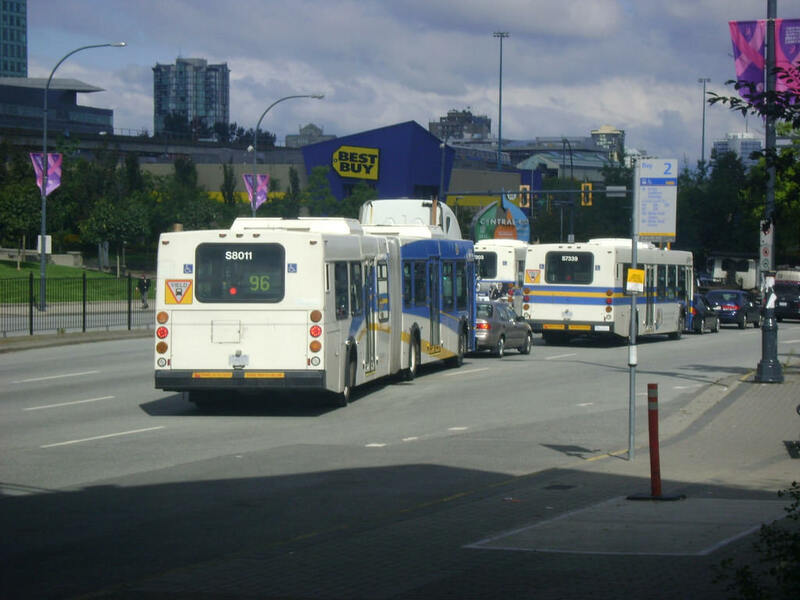 Posted on June 2, 2018 June 2, 2018 by UrbanSurreyPosted in TransitTagged 104 Avenue, 104 Avenue Corridor, King George, LRT, SkyTrain, Surrey Central, SurreyLRT, TransLink. Next Next post: Concord proceeds to Council with next phase of ‘Park’ towers.